If you’ve read this blog since its beginning, you may know that i am somewhat obsessed with Seefeel and all of its related side projects. Well, scratch the last few Scala records from that statement and then it will be true. I chickened out of buying this ep when it came out in the hopes that there would be an eventual album, but it never came to be. 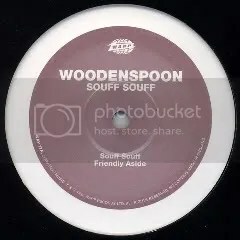 Woodenspoon was one of Marc Clifford’s projects after the dissolution of Seefeel. He also released an ep and Lp for Warp as Disjecta. Disjecta wasn’t too far removed from the direction Seefeel took on their last two albums, but Woodenspoon provided Clifford an outlet to explore drill and bass, dub and occasionally something approximating dancehall shoegaze. Now, I don’t expect Capleton or the many Ranks to come knocking on his door, but this ep definitely tries something new. It doesn’t always work, but it is interesting to hear him shake loose from his influences. In this day and age, I have lost all interest in any of the drill and bass of the late 90s and its masturbatory usage of rhythm. Just because you can pack so many beats into a minute doesn’t make it it more enjoyable. However, Clifford does incorporate some ethereal drones straight out of Quique to accompany the spasms of beats and it works here. It doesn’t make me want to reevaluate that era, but it is a nice twist on the dub/shoegaze/electronic tomfoolery he perfected with Seefeel. Overall, it isn’t going to floor you, but any fan of Seefeel should check this ep out since it is interesting to hear their musical inspirations translated into a different arena. Good, but not great.